Getting reeeaaal sick of your cheek, Calgary! My takeaway from this is that you can add Hockey to the back end of any players name and it suddenly makes them good. Except for Johnny Gaudreau, he’s legitimately good. Johnny Hockey for the win. My good sir, you mistake me for a leafs fan. I like you watched in disgust as phanuef escaped the penalty box time after time. Bernier stole that game for the leafs. Everyone else was just along for the ride. Calgary not only worked harder but were better everywhere except the score sheet. Johnny Hockey was worth the price of admission once again. Toronto… making fun of people? that’s rich. You still have Dion, so we won that trade. Yeah we have a number one defence man, and you have Matt Stajan…. You totally won that trade…. Edmonton really needs an NHL hockey team! That makes you slightly less annoying than Lambert. Slightly. You got a giggle out of me, so good job. But I still hate you…. I love Steve! I watch his videos on youtube, and he’s pretty darn funny. But that was too far going after Gaudreau and putting Hockey after all your little Leafs players. Friends off Steve. Friends off. Haha that’s pretty good! The mental image I had of the Dangle designed flames jersey was priceless. Who the hell is this douche? Well, get the hell off our page…..
And for the love of all, lay off the caffeine. You went back for seconds on the joke, which is kind of lame, but “James van Hockey” was pretty damn funny. Big fan of Dangle. Too bad he’s a damn dirty Leafs fan. He’s almost funny. Can the yelling, the waving of the hands, the zoomed-in mise-en-scene, the man himself, and you have yourself a good video. Phaneuf – A #3 defenceman masquerading as a #1 and grossly overpaid FOR THE NEXT 6 YEARS!!!! Who do you thank for that pair of handcuffs? Was it the moustache that fooled you. Calgary should be very happy with Stajan thank you. At least they aren’t delirious about what he is. Plays against the toughest competition, puts up #1 offensive numbers, has a hot wife. That’s a #1 anywhere baud. Enjoy you overpaid 4th line Center/ healthy scratch tho ;). 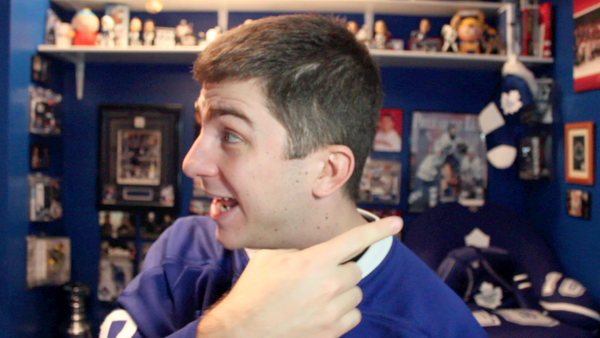 Steve Dangle is awesome, and if you don’t like his vidcast, you are dumb.